Every time I take part in an event, I meet visitors who say ‘Ooh, what lovely lamps, X would love one of these, but I don’t know which colours they’d like’, or ‘She is very particular and I wouldn’t dare choose for her!’. 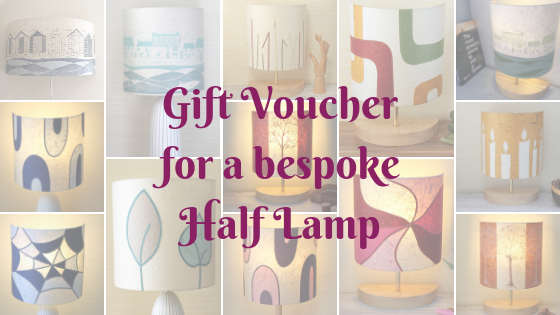 If you know someone special who would love one of my lamps but feel it’s too risky to choose for them, the colour, design or even the particular place on a map, then perhaps consider a Gift Voucher? You can purchase a Gift Voucher, for the price of an off-the-shelf lamp*, and your lucky recipient can then take their time to choose whether they’d like big and bold, soft and subtle, blues or greens, pinks or oranges, stitched patterns or linocut prints. Or, if it’s a map lamp, they can pick their favourite place that has meaning for them. They can choose from what I have in stock or specify a made-to-order lamp. The vouchers are valid for one year from the date of issue, so they will have plenty of time to decide. 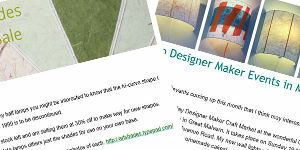 I can send the voucher by post to you or the recipient or, if it is very last minute, I can email an electronic version. You can pay by bank transfer, cheque, Paypal, or with cash or via card machine at my next event – Designed for Christmas at the Weavers Gallery in Ledbury. Just email me sarah@artshades.co.uk letting me know which voucher you would like, the recipient’s details and how you’d prefer to pay. if you have any questions, feel free to email me those too. NB The voucher covers the cost of the lamp, either made-to-order or off-the-shelf. All delivery costs will be charged at my standard rate. *At current prices, this represents a saving of £10 for map drum lamps and £20 for all half lamps against made-to-order prices.